Hey there! Thanks for dropping by The Rice Always Boils Over! Take a look around and grab the RSS feed to stay updated. See you around! Did you know it’s possible to make tofu that doesn’t taste like feet? No? Neither did I! You might be asking yourself why, precisely, I was cooking tofu the other day when I was firmly of the opinion that it tastes like feet and that there are far better ways to get protein (nuts, dairy, eggs, or for us non-vegetarians, meat). Well, the answer is that my vegetarian husband picked up a package of tofu at the grocery store and wanted us to try and make it like some of the “good” restaurant tofu that’s out there. And tofu *is* actually quite healthy. Now I will admit that there are varying degrees of tofu awfulness, and that I have, on occasion (usually in Asian restaurants), had tofu that bordered on being edible. But I had never yet found tofu that I actually wanted to eat (unless I were starving on a desert island somewhere.) However, I do like a challenge in the kitchen, and I did want to find a way to add more calories/protein to my typical stir fry recipes so that we wouldn’t negate the healthiness of all the vegetables by gorging ourselves on gelato afterwards. So I needed some help. I turned to Alton Brown, who is pretty much always the best source of information on how to cook an unfamiliar ingredient. Or a familiar one for that matter. I remembered having watched the tofu episode of Good Eats, and since we never delete Good Eats off the dvr, it was a simple matter of endless scrolling to find it. What I was looking for was this recipe: thick slices of firm tofu, marinated, battered with egg and fried. I decided, however, to make my own marinade, since I intended for this tofu to go with Asian-style stir fried vegetables. While the tofu slices were being squished to remove excess moisture and render them ready to soak up my marinade, I took stock of my pantry options. Tamari soy sauce of course would be a key ingredient for the marinade. Mirin and rice vinegar also seemed like good options to get a bit of acidity in there. Sriracha of course would bring the heat, ginger and lemongrass would add another nice flavor dimension, and then I remembered! I had a sad, lonely lime sitting in the fridge, left over from making the curry paste. It was a bit ugly on the outside, having given up its zest to the curry, but the inside was still bright and fresh, and full of juice! This, in the end, turned out to be the key marinade ingredient, and the main one that I was able to taste in the finished product. After the tofu had soaked in its marinade bath for half an hour (15 minutes per side), it was time to fry it. But this time I was prepared! With the aid of Alton Brown’s recipe, I was able to create a nice egg batter that stuck to the tofu. I decided to go with grapeseed oil instead of canola oil for frying because grapeseed oil has a much higher smoke point–thus I would be unlikely to smoke it. I had spring-loaded tongs at the ready for flipping the tofu, and a thermometer so that I could periodically monitor the oil temperature. After heating up the oil, I gently placed the egg-battered tofu into the pan. Instant sizzle – success! I kept an eye on the temperature and after two minutes, flipped each piece–they were actually golden brown! After another two minutes I removed them to a cooling rack over a sheet pan to drain. They smelled good! I assumed the pleasant smell was just the egg batter, but I was quite pleased that they came out looking like they were supposed to. Meanwhile it was time to stir fry the vegetables. I had already chopped them up while the tofu was marinating, and since the burner was still hot, it was a simple matter to grab another (larger) frying pan, add a little oil, and toss the veggies in. 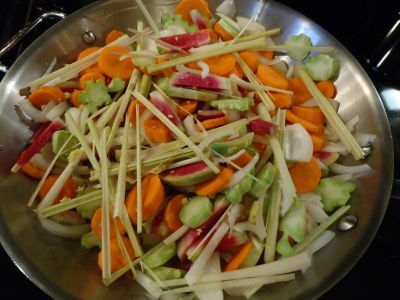 You might want to tie your lemongrass in a bundle for easy removal. Doing it this way was a mistake. After the veggies had softened up a bit, it was time to deglaze the pan and get some flavor in there. I had planned on just using the rest of the marinade to accomplish this, but I overestimated how much was left and underestimated how much I would need to create any sort of sauce. So I added more tamari, mirin, and rice vinegar, along with a sizable squirt (okay, several sizable squirts) of sriracha, and more grated ginger. I also added the broccoli and finely sliced Thai chiles at this point, because I didn’t want them to overcook. I covered it with a lid that is rather too small for the skillet, but it was good enough to collect some steam to cook the broccoli faster. After a few more minutes, it was done! And then it was time to taste it. I cut off a corner of the tofu, admiring the crispy egg crust, and popped it in my mouth. And was shocked! It tasted good! Not just in an I-can-see-how-this-would-be-good-if-you-liked-this-sort-of-thing way, but in a legitimately I-want-seconds kind of way! It was delicious! There was no trace of the soy flavor I typically find so unpleasant. Just crispy egg batter, a pleasant tang from the lime, and a soft texture somewhat akin to a fluffy quiche. No longer could I say that I hated tofu. Hats off to Alton Brown. His tofu-cooking technique is without equal. 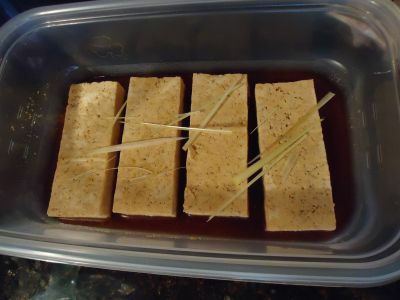 Drain the liquid from your package of tofu, and then slice it and press the rest of the liquid out as per Alton Brown’s recipe. A few minutes before it’s done, get out a container with a tight-fitting lid that’s big enough to fit the slices of tofu side by side. Add in the tamari, mirin, rice vinegar, sriracha, lime juice, ginger and lemongrass and stir until the sriracha is fully dissolved. Taste it, and add more sriracha. (Don’t worry–you can add a whole lot and your tofu still won’t be spicy.) When the tofu is ready, put it in the marinade, cover it up, and set aside for half an hour. If the tofu isn’t fully submerged, flip it halfway through. Meanwhile, wash and chop up all your veggies. Be sure to mince the Thai chiles very finely because they pack some punch! This is also a good time to get your rice started, since it will take a good half hour (more if you’re using wild rice) to cook. If you happen to have two good skillets (and two good burners), you can fry the tofu and stir fry the vegetables at the same time. The vegetables don’t take a whole lot of attention, and the tofu isn’t hard to fry. But if you want to do them one at a time like I did, start with the tofu. I followed Alton Brown’s instructions pretty much exactly, right down to the spring-loaded metal tongs. The only change I made was to use grapeseed oil instead of canola oil. This is not strictly necessary, but if you do use canola oil, keep a closer eye on the temperature. Grapeseed oil is good to 420 degrees. Canola oil varies significantly depending on how it’s processed, but the kind I have is only good to 375-400 degrees. And I have made it smoke before. Grapeseed oil seemed safer. 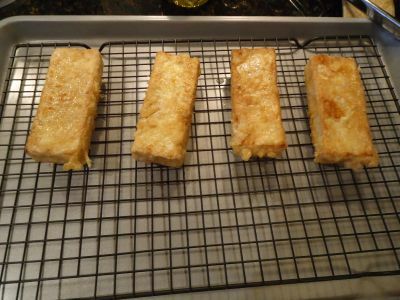 When your tofu is done, remove it to a wire rack over a sheet pan to drain off any excess oil. For the vegetables, heat a little oil in your skillet and add everything except the broccoli and Thai chiles. Toss/stir them around occasionally. 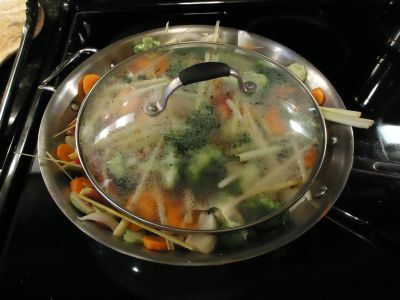 Once your vegetables have started to soften, deglaze the pan with the extra marinade plus equal parts additional tamari, mirin, and rice vinegar as well as some sriracha. You want just enough to create some sauce in the bottom of the pan. Add in the broccoli and Thai chiles, stir, and then cover to let the broccoli steam. By the time your vegetables are done, your rice should also be done. Put some rice on each plate, top with vegetables and a slice of tofu, spoon a bit of sauce from the vegetable skillet over the top, and enjoy!